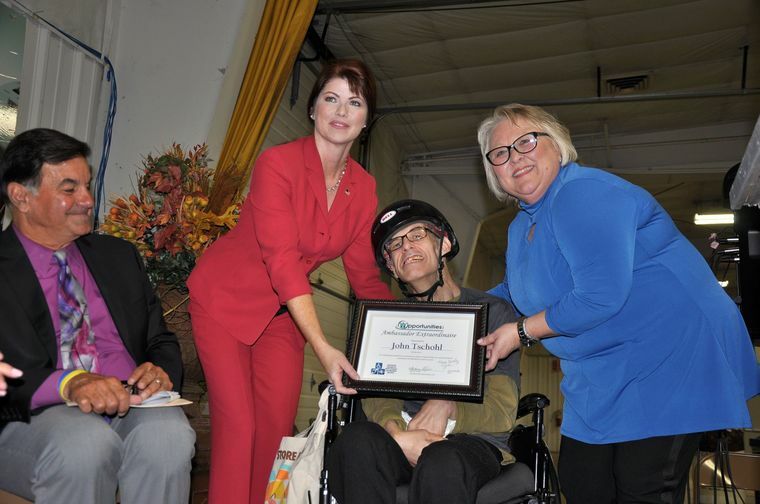 Opportunities Marks 50th Year - Opportunities, Inc.
JEFFERSON — Opportunities Inc., which has provided social and employment services for people of diverse abilities for the past five decades, celebrated its 50th anniversary Friday with a ceremony and luncheon at the Jefferson County Fair Park. Keynoting the event was Wisconsin’s Lt. Gov. Rebecca Kleefisch. 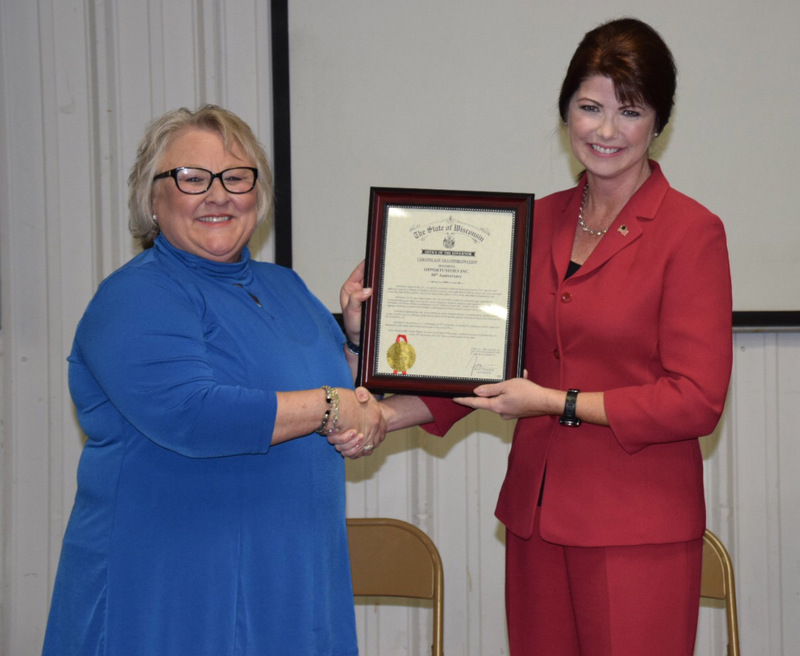 On top of talking about the importance of Opportunities and programs like it, Kleefisch presented the nonprofit agency with a proclamation from Gov. Scott Walker honoring Opportunities’ contributions during the past half-century. The gathering also marked National Disabilities Employment Awareness Month, with the message of inclusion driving innovation. The national campaign aims to raise awareness of how employing people with disabilities/various abilities can be a win-win for both industry and the individual employees. Barb LeDuc, president and CEO of Opportunities, welcomed attendees and recognized those who helped to establish Opportunities five decades ago. Among those in the audience were Susie Waterman, a member of the Opportunities team and the daughter of one of the mothers who founded what was then a “sheltered workplace” 50 years ago. Also present was Spence Jensen, longtime former CEO of Opportunities, who played a key role in the organization’s growth and success and, though retired, continues to support its mission. In addition, several past and present board members for Opportunities were on hand. LeDuc recognized the organization’s community partners as well, ranging from Jefferson County Human Services, the Fort Atkinson Area Chamber of Commerce, the state Department of Workforce Development and Division of Vocational Rehabilitation, the state Department of Corrections, Rehabilitation for Wisconsin, Source America and more, along with the many individual businesses and organizations with whom Opportunities works. Also on hand were state Sen. Steve Nass, R-LaGrange, and state Rep. Cody Horlacher, R-Mukwonago. Opportunities got its start as a grassroots foundation in 1966. Over the years, it has expanded greatly, but the organization’s core mission has remained the same — advancing people of diverse abilities and helping them achieve their potential in the workplace and community. When the organization started, it focused on adults with developmental disabilities, but it has broadened its focus over the years to include people with physical and intellectual disabilities, those with mental health issues, people who have been in the correctional system, those speaking English as a second language, dislocated workers, people coming out of the military and others with significant barriers to employment. As of 2016, the organization had 5,500 people on its annual payroll. On top of its employment focus, Opportunities also provides community services to foster social engagement, and it does all this with less than 25-percent government funding. For many years now, Opportunities also has provided vocational scholarships that allow people who could not otherwise participate in its programs and who have no other source of funding the chance to take part. Last year, Opportunities hit a record of giving back $1 million in the form of these vocational scholarships. LeDuc said it always serves as an inspiration for her to visit with the people that Opportunities serves and to see them making a difference and living up to their potential, both in Opportunities’ on-site plants and out in the community at various businesses. Kleefisch then stepped up to the podium, saying that this anniversary gave her the chance to focus in on the challenges the state has in terms of employment and on the solutions Opportunities and organizations like it present. Kleefisch said that people with disabilities represent a tremendous opportunity in today’s economy. She noted that Wisconsin has a low, 3.4-percent unemployment rate, with around 100,000 open jobs. Meanwhile, Wisconsin is set to welcome a couple of big additions to its economy, creating more openings, she said. These include a new plant planned by Haribo, a German company that makes chewy gummi bears, and the much-anticipated Foxconn plant in Mount Pleasant. While Wisconsin has very low unemployment overall, Kleefisch said, those with disabilities have a high unemployment rate and represent an undertapped resource. She said that when she talks with representatives of companies from Wisconsin and beyond, few are aware of the tremendous opportunities this population represents. Meanwhile, those who are hired by a specific company have an 87 percent likelihood of patronizing that company. Actually, she noted, for every $1 companies spend on accommodating employees with disabilities, they get a return on their investment of $28.69. And most employers don’t need to make any accommodations at all. In terms of employee turnover, people with disabilities also present an advantage, Kleefisch said. The turnover rate for traditional employees is 45 percent, she said. Compare that to the turnover rate of only 8 percent for people with disabilities. “You are going to get a tremendous return on your investment,” Kleefisch said, noting that employees with disabilities tend to be more loyal and stick with a job, as opposed to the general population. Hiring people with disabilities means less time spent training a round-robin of new employees. Kleefisch also commended Opportunities and those the agency serves as being tremendous advocates for people with diverse abilities. She said this advocacy directly led to Joint Resolution 51, in which the Wisconsin Legislature acknowledged the right of people with disabilities to work wherever they wanted. Kleefisch then presented LeDuc with the proclamation from the governor honoring Opportunities and its contributions during the past five decades. Also speaking was Banga “Ginger” Kollmansberger, regional director for U.S. Sen. Ron Johnson’s office, relaying Johnson’s own commendations of Opportunities efforts on behalf of those with diverse abilities. At the end of the ceremony, Opportunities had some honors of its own to present, one to an individual advocate and another to a local business which has been an incredible supporter of Opportunities’ mission. The “Opportunities Inc. Ambassador Extraordinaire” award went to John Tschohl, who has been a member of the Opportunities team since 1969. Having cerebral palsy, Tschohl uses a wheelchair and faces various physical limitations, but through his typewriter and then computer, he has served over the years as a voice for the voiceless and a tireless advocate for people with disabilities. “John’s words are golden,” LeDuc said. When there was a story to be told, she said, Tschohl made sure it was expressed within the context of choice, dignity and meaning for all people, regardless of ability. Tschohl’s advocacy efforts as part of Opportunities “A-Team” earned him the 2016 Rehabilitation Advocate of the Year award from Rehabilitation for Wisconsin. They also earn him the eternal thanks of Opportunities and all of the people it serves. Incidentally, Tschohl’s birthday was Friday, so on top of his recognition plaque, Opportunities presented Tschohl with a specially decorated birthday cake. The final honor was a “Business Partnership Recognition,” given to Seljan Co., a Lake Mills plastic and metal manufacturing company that has worked with Opportunities in many capacities, employing and providing opportunities for people with diverse abilities. Accepting the award on behalf of Seljan were Erin Stein, human resources manager, and Dru Laws, vice president. Seljan has committed to working with Opportunities and the people the agency serves, and renews that commitment every day in numerous ways. Furthermore, company representatives share their experience with others, spreading the word about the opportunities that workers of diverse abilities present. Accepting the award on behalf of Seljan, Laws said that he has a son, 10, with Down’s Syndrome, and he hopes that someday, somebody does for him what Opportunities does for so many. He said that his company has experienced the same benefits Kleefisch noted through employing people with disabilities — the low rate of turnover, the loyalty and pride in employment. (Left) Wisconsin Lt. Governor Rebecca Kleefisch presented the agency with a proclamation from Gov. Scott Walker honoring Opportunities' contributions during the past half-century. (Right) John Tschohl was recognized by the agency andreceived an Opportunities, Inc.'s Ambassador Extraordinaire award. Tschohl has been a member of the Opportunities, Inc. team since 1969. 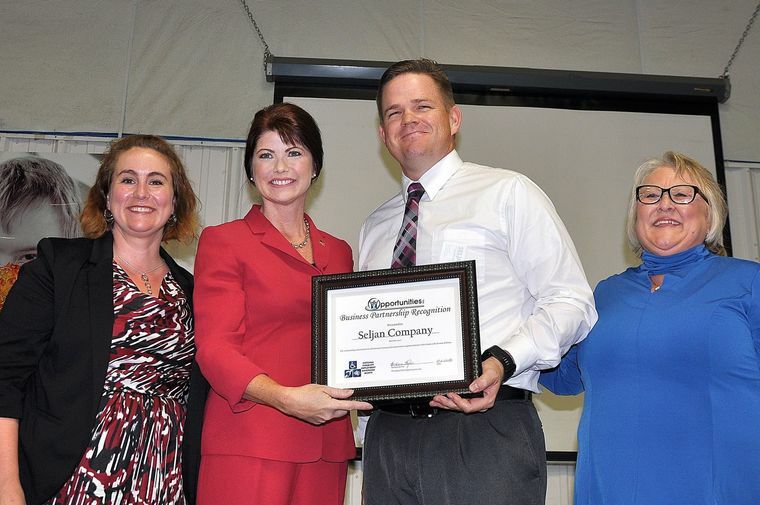 Pictured: Opportunities, Inc. presented Dru Laws, Vice President, and Erin Stein, Human Resources Manager, on behalf of Seljan Company a "Business Partnership Recognition" for working with the agency in many capacities, employing and providing opportunities for people with diverse abilities.